The Wocket, which stores up to 10,000 credit cards, can only be activated with voice recognition, a PIN or a shape drawn on a touch pad, having it impossible for thieves to crack. A high-tech wallet that stores up to 10,000 credit cards was touted Wednesday as the latest weapon against identity theft. 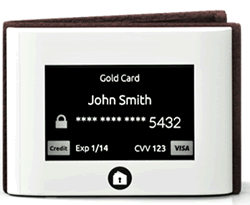 NXT-ID unveiled its $149.99 Wocket at a lavish, open-bar press conference at The Plaza hotel. Slightly smaller than an iPhone, the Wocket is an encryptic, tamper-proof gizmo that can only be activated with voice recognition, a personal identification number or a shape drawn on a touch pad. If it’s ever stolen, thieves will find it impossible to crack, said Gino Pereira, the CEO of Shelton, Conn.-based NXT-ID. The device contains a single card for merchants to swipe after owners select a credit card, coupon or gift certificate.